ISCDD is the copyright owner the Medication Satisfaction Questionnaire (MSQ) and GRID Hamilton Rating Scale for Depression (GRID-HAMD), a modified version of the popular depression rating scale developed by Max Hamilton, and its related materials including: the questionnaire and structured interview guide for the GRID-HAMD-17 and the GRID-HAMD-21, the Single Item MSQ, and the Three Item MSQ. We offer licensing of these instruments for use in a variety of languages and settings that include research studies and clinical trials. Licensing is free for academic use. To apply for a license or for any questions related to Scale Licensing, please contact secretariat@iscdd.org. The GRID Hamilton Rating Scale for Depression (GRID-HAMD) is a modified version of the popular depression rating scale developed by Max Hamilton in 1960. The GRID Hamilton Rating Scale for Depression (GRID-HAMD) is a modified version of the popular depression rating scale developed by Max Hamilton in 1960. One difficulty in administering earlier versions of the HAMD is that two important dimensions of illness severity—intensity and frequency—must be taken into account when making a single rating. However, there are no guidelines for the rater to help determine the contribution of both to symptom severity. The GRID-HAMD was designed to permit the rater to consider the dimensions of intensity and frequency independently for each relevant item in the scale. Symptom intensity is considered on the "vertical axis" and symptom frequency on the "horizontal axis." Symptom intensity, which includes degree of symptom magnitude as well as subjective distress and functional impairment, is rated as "absent, mild, moderate, severe, and very severe." Symptom frequency is rated as "absent, occasional, much of the time, and almost all of the time." Examples of degrees of intensity and frequency are provided in the GRID itself. The GRID-HAMD was designed to both simplify and standardize administration and scoring in clinical practice and research. 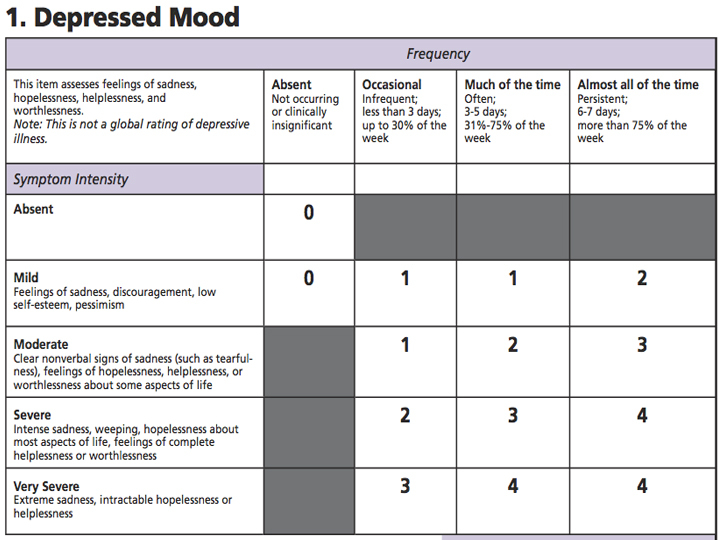 Item descriptions have been modified to enhance the reliability of the scale and its relevance to depressed outpatients. The GRID-HAMD includes a structured interview guide and set of rating conventions. Like many other psychiatric semi-structured interviews, the GRID-HAMD is intended for use by individuals who have received adequate training in the assessment of mood in a depressed population and in the use of the GRID-HAMD itself.